Venerable Master Cheng Yen (證嚴上人) is a Chinese Buddhist teacher and philanthropist. She was born in 1937 in Chingshui Village in Taichung County in Taiwan. Her uncle was childless, so she was given to be raised by her aunt and uncle. At the age of twelve, her father died suddenly from a stroke; it was searching for a burial place for him that Cheng Yen first came into contact with the Buddhist Dharma. 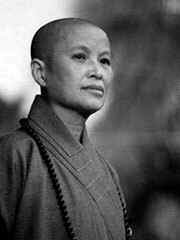 In 1963, she became the disciple of her mentor, the late Venerable Master Yin Shun, who gave her the dharma name of Cheng Yen and the courtesy name of Huichang. Yinshun also gave her the great expectation of «doing all for the Buddhist religion and for all beings», which is written with six characters in Chinese. From then on, these six characters became the highest ideals for Cheng Yen in belief, teaching, and practice. In 1966, Cheng Yen founded the Buddhist Compassion Relief Tzu-Chi Foundation, commonly known as Tzu-Chi; its motto is «instructing the rich and saving the poor». Later, Cheng Yen’s Charity, Medicine, Education, and Culture Missions developed, and to the present the Tzu-Chi Foundation has become involved in international disaster relief, bone marrow donation, environmental protection, and community volunteering. Among other recognitions, Cheng Yen was nominated for the Nobel Peace Prize in 1993. In order to address the nurse shortage on Taiwan’s east coast, the entire nurse-supply of the Tzu-Chi Technical College was offered. Tzu-Chi’s goal in this activity is to provide fine nurses with compassionate hearts. Cheng Yen resolved to organize and build the Tzu-Chi Nursing College, and with the assistance of many people, it was founded in 1989 in Hualien. Invention Educational Medal, the 44th Geneva International Invention Exhibition. Chinese Buddhist Bhikuni Association «World Buddhist Outstanding Bhikuni Contribution Award». The «Health Award» of the «Sri Sathya Sai Awards for Human Excellence 2016» in India. «Honorary Fellow of the Ukrainian Academy of Sciences». Chinese Hall of Innovative Inventions «Hall of Fame». Better Malaysia Foundation People Award. Important citizen of the city of Finare Emilia, Italy. International Rotary Club «Highest Honor Award». Winning the title of «Datuk Seri» in Malaysia. Teached the Honorary Doctorate of Social Welfare from the Chulalongkorn University in Thailand. The US magazine «TIME» was voted «2011 World’s Top 100 Influential People». Won the honours degree in Humanities from the Oriental University of the Philippines. Won the «Outstanding Public Service Award» from the Roosevelt Foundation of the United States. City of Vancouver, Canada, «Master Cheng Yen Day». The 3rd «Organic Agriculture Excellence Award». Foresight magazine «Towards Copenhagen, looking for Taiwan’s environmental heroes» officials and leaders of Taiwan’s environmental heroes. Taiwan Celebrity Encyclopedia Social Class «Model Celebrity of the Year». The 3rd International Charity Forum «International Charity Meritorious Person Award». The Global Buddhist Contribution Award was awarded by the World Fellowship of Buddhists. The 2007 World Peace Prize was presented by the Los Angeles Chinese Association of Elected Officials (CEO). The «Twenty-fourth Wilderness Peace Prize» was presented by the Japan Takino Peace Foundation. The Asian American Federation of California (AAFC) 2004 Asian American Heritage Award for Humanitarian Service. The Daily Volunteer Association (DVA) is a group and individual who recognizes volunteers in all walks of life. In 2004, the first «One Log Art Award» was held. The person was awarded the «Special Award: Lifetime Achievement Volunteer Award». Achieved the «Third Outstanding Education Enterprise of the Third Private School» by the Private School Culture and Education Association. Achieved the «Second King of Stars». Winning the «Buddhist Outstanding Women Award» from the World Buddhist University. The University of Communications received a degree in «Honorary Doctor of Social and Cultural Studies». A degree from the University of Hong Kong awarded the «Honorary Doctor of Social Science». The President of El Salvador awarded the «National Second Order Medal». Canadian Education Bureau-designated high school elective textbook «World Contact — Geography in the 21st Century», including the charitable deeds of Supreme Master and Tzu Chi Foundation. Recommended by more than 30 academic education experts in the United States, and honored the Philadelphia National Freedom Museum as a «model of honor heroes in the 21st century», becoming the world’s 27 most representative representatives of human peace. One. Reported by the January issue of «World Magazine», it is listed as one of the 200 characters who have influenced Taiwan’s development in the past 400 years. Taiwan’s Qingshui National Small 100th Anniversary Special Awards «Outstanding Alumni Award» to recognize the contribution of the Master to the society. The Ministry of the Interior awarded the «First Prize of Internal Affairs» and «Hong Kong Reward». The Ministry of Foreign Affairs awarded the «First Class Diplomatic Medal». The Overseas Chinese Affairs Committee awarded the «Huaguang First Prize». Selected as one of the «Twenty Asian Outstanding Women» by Hong Kong Asia Weekly. The Kaohsiung City Government awarded the «Taiwan First, Kaohsiung First» Outstanding Memorial Award. The Executive Yuan Cultural Award was presented by the Cultural Construction Committee of the Executive Yuan. The World National Diplomatic Association (PTPI) awarded the highest honor «Eisenhow International Peace Prize». Recommended for the Nobel Peace Prize. A degree from the Chinese University of Hong Kong to the Honorary Doctorate in Social Sciences. The International Communication Award is presented by the Information Bureau of the Executive Yuan . The Magenssey Social Leadership Award was presented to the Ramon Magsaysay Award Foundation. The «Outstanding Social Movement Leadership Award» was presented to the first Social Sports and Wind Awards. Welcome to the US «Texas Honorary Citizen», «Santa Anthony Honorary Mayor», «St. Anthony’s Honorary Territory» and other medals. Taiwan Foundation awarded the «Social Service Award». Awarded by the Wu Sanlian Foundation for the Social Service Award. Winning the 75th year of the Taiwanese good deeds.